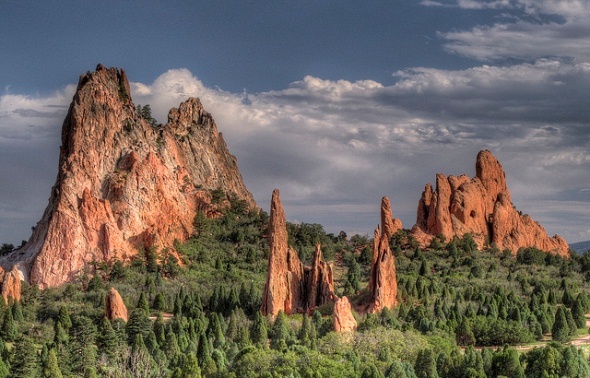 The Garden of the Gods Park at the foot of Pikes Peak is a bonanza for photographers with its magnificent red sandstone formations such as Kissing Camels and Balanced Rock. Dramatic vistas can be found at all times of the day and night from multiple viewpoints. Railroad magnate Charles Elliot Perkins donated the 1,300-acre park to the city in 1879, stipulating that it stay open and free to the public. The park houses a cast of the Theiophytalia skull discovered on its grounds in 1878. In 2008, a paleontologist from the Denver Museum of Nature & Science determined that the bone had been misclassified and actually was a new type of dinosaur, which he named Theiophytalia, or “belonging to the gods,” after the park where it was found. Trails for hiking, horseback riding, mountain biking and guided nature walks are open year-round. A visitor center orients newcomers to the park’s history and the available activities.